Just as the picture proclaims, I love blogrolls. The one just east of this post entitled Top Shelf is where I check out all of your hard work! There are so many new blogs coming out, and so many I missed during my sabbatical, that I want to feature you here. Think of it as a chance to publicize yourself for free! Unless I happen to be drilling around another card blog, I might miss your site. So, if you'd like to have your blog part of my blogroll, just drop a comment and I'll add your blog. My only request is that you add my blog to your blogroll (if you have one). PS - Something Stupid for the win! Hello! Not sure if I am on your blog roll or not. Thanks. 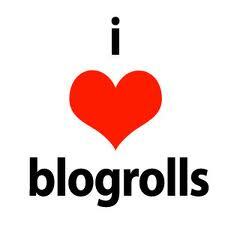 I, too, love blogrolls. I wouldn't mind getting added to yours. Added you a while back, would be great if you could add me if i am not on there just yet !! Blogrolls, for the win! You're on mine, can I be added to yours? All four of you are on my blogroll now. Make sure I'm on yours please!